It's fig season and the tree in my backyard is finally starting to ripen the many green globes that have been hanging around patiently for the past month. 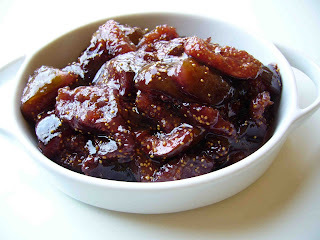 It was time to get a fig compote going. This is great over ice cream, on toast or just about anywhere you would use a jam. Remember that this won't have any preservatives so use it up in a few days to keep it from going bad. Quarter figs and place in a medium sauce pot with water and sugar. Place pot over medium heat and simmer for 45 minutes, stirring occasionally. Bring to room temperature and use immediately or store in fridge for a few days. Enjoy! Please send me some, I am salivating!